Buying a entire bedding package in Sydney can be a thrill, provided everything falls into place nicely. I've kept the bed frame but recently purchased a new mattress, mattress protector, pillows, duvet set, sheets and a new quilt. The fully monty where clever negotiating went a long way. 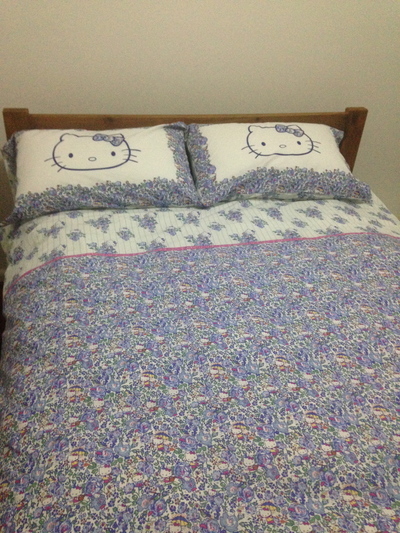 Where is the best place to buy bedding items for the home in Sydney? When bedding items are on sale at Myer in Sydney City - the bedding world is literally your oyster. Brought two brand new pillows; a sheet set; a duvet set, and a new winter quilt for only $385 at 40% off. Brought my brand new mattress and mattress protector elsewhere. Plus I gained some points on my Myer One membership. All in all, these goodies were also easy to take home on the train in peak hour. Loved the double bagging too. Excellent service enjoyed. Adairs and Bed, Bath & Table always have beautiful sheets, pillows and duvet sets etc. They are a little pricey but often have great sales so you just have to make sure you look out for the deals. I also love Adairs and Bed, Bath and Table. While a bit on the expensive side their items are beautiful and well made, and if you hit a sale can actually be quite decently priced. If I'm in a financial pinch though I'll probably head to Target for sheets and duvet covers, and either Spotlight or Trade Secret for good quality pillows. IKEA! Everything's so cheap and stylish. IKEA is basically my idea of heaven. What is the easiest way to get around Sydney city? Best way to get to Sydney Airport?